My name is Felicia and my daughter is Alexandria, we call her Lexy.My pregnancy and delivery with Lexy went perfect. I could not ask for any better. Lexy was born January 10th, 2008 as the most beautiful and healthy baby ever. Until April 28th, 2008 when she was just laying on the bed playing and my husband and i were just talking when i turned around to look at her i saw her right arm go straight up in the air and it started twitching i knew it was a seizure. My husband thought she was just playing but i knew better so we immediality rushed her to the ER and they lifeflighted her to another hospital. I was so terrified I thought it was the worse day of my life. She went through every test there was and they all came back normal over and over and over. The doctors said that she would probably never have another seizure agin.June 13th,2008 Lexy had her second seizure almost two months later and then i knew something was wrong and once agin she went through all those test agin and they all came back normal agin. The next month she had two seizures and i did not know what to do. The doctors called it an unknown seizure disorder but i would not take that for an answer so i took her to other neurologists' and they all just kept telling me the samething over and over. In August of 2008 Lexy had about three realy big seizures a week being lifeflighted twice and constinalitly in the ambulace to the ER. 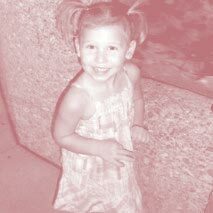 Something was terribly wrong with my sweet baby girl and no one could give me the answer i was looking for. I even had a doctor accuse me of making her seizures up because they were so long and the test all came back normal so he thought that was impossible even though another hospital had lifeflighted her there and whitnessed all her seizures. I was so scared i did not know what to do and how to help the most precious thing in my life. Finally September 1st i got my answer. On my way to see my husband graduate basic traning for the army Lexy had another big seizure the biggest (2 hours and 45 minutes) and we were closest to St. Louis Childrens hospital so thats were we went. Within 5 minutes of me explaining her seizures they diagnoses her with dravet syndrom. That became the worst day of my life when i looked it up on the internet. I was so shocked there was no way that my Lexy could have this horrible disease but then i got the gene test back and it was positive. I was and am still so scared for her futureSometimes her seizures are so hard to control that the doctors have to give her so much medication to stop the seizure that it puts her in a medicated coma and that have to intibate. It breaks my heart have to watch her go through so much. Lexy has amazed us with her development. She continues to show progress every day. She does recieve speech,physical,and ocupational therorpy. Her speech is very delayed and she walks good but not like other 2 year olds, and she has just recently had alot of scencory problems. Lexy is one the the happiest toddler i have ever seen, she always smiles even on days when she has had dozens of seizures and is in the hospital she always seeems to wake up with a huge smile on her face. I have never seen a child so strong like her. I gotta say i admire my child more then anyone. All her doctors are amazed with her progress but the future is still there and i am terrified.I just pray and hope for the best. Lexy is the happiest little girl ever. She always has a smlie on her face excepet when being poked with needles for ivys and all messed up on all the medication it takes to stop her seizures. She is an amazing little girl!!!!!!! Submitted 22November 2010 (by by Felicia (Alexandria's mum).